There’s no shortage of “How to Write a Spec Script” posts out there, and they tend to come in two forms. Articles about writing on spec either spotlight “business side” considerations — marketplace demand, how to get your material out there, which contests to enter — or they give guidance on the creative process: how to find inspiration, ways you can push your imagination, and spec script format. In truth, writing good scripts comes down to a balance. In this post, we provide that balance, all with the goal of leading you, our reader, to spec script sales. We analyze industry realities and share techniques to give you the tools to strategically write good scripts and find work as a writer. After all, the film and TV industry has always walked a line between bare-knuckle business and cutting-edge creativity. It’s equal parts art and commerce. Writing on spec and getting ahead requires a two-pronged approach without sacrificing momentum. So read on, and get rolling. Writing on spec is a common practice in Hollywood. Whether or not they’re “in the industry,” film and TV specs can be a great tool for writers to sell their voice to potential buyers. In this post, we cover both feature film and TV spec scripts. So exactly what is a “spec” script? A “spec” (speculative) script is a film or television script written independently of a production entity. “Writing on spec” refers to when a writer crafts a script on his or her own, with the goal of either selling it or securing representation for further assignments. The annual Black List ranks the best spec scripts of the year. Why write a script on spec? Generate material to show to producers and reps.
Showcase your ability as a writer. 2. Can writing on spec pay off? It has been debated whether or not writing on spec can be valuable. After all, today’s entertainment landscape is dominated by franchises and existing properties with built-in audiences (like comic books). Additionally, it is virtually impossible to get an unsolicited script read by a production company. So why is anyone writing on spec? Well, the goal for any writer is to generate momentum behind their name or their project. This can lead to meetings with producers, representation, and meeting with head writers of popular shows. If you have a spec that gets you noticed, that’s only the first step. Once you get into a room, you’ll also get asked if you have more materials to show. That’s why veteran screenwriter John August suggests arming yourself with an additional feature film spec, a sample episode spec, and a pilot. 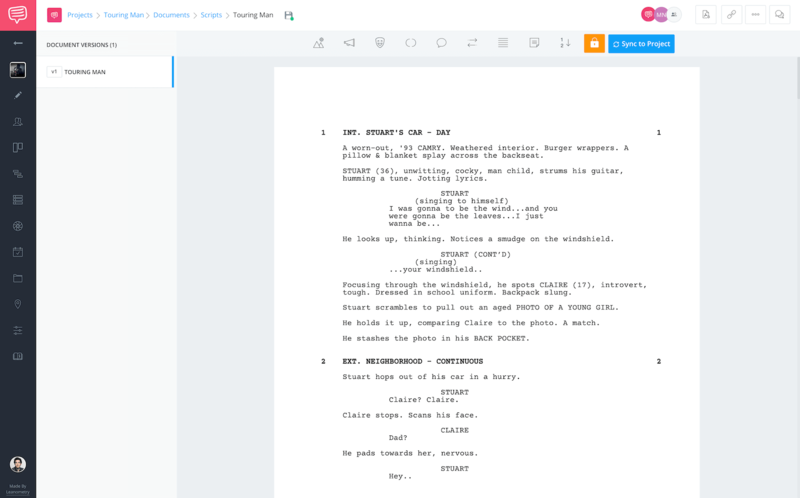 First thing you need is a professional screenwriting software that uses industry standard formatting so that your script will be taken seriously. When approaching any writing project, it’s always recommended to write an outline or treatment to get your ideas solid. That way you won’t get lost in a maze of ideas. Then, when you actually set to writing, keep your eventual reader in mind. Even more important than the agents and producers you wish to attract are their readers. These are usually assistants with tall stacks of good scripts like yours to get through every day. So you’ll want to do a few things to keep them engaged. First, make sure your scripts follow industry standards. Don’t try to spice them up with fancy titles, fonts, or images. As far as spec script format, generally just make sure your script looks like any other professional script. Here at StudioBinder, we’ve put together a TV Writing & Development Master Class which will take you through each step of the development process, and keep you on track while you write your ideas. The lessons included in these seven separate courses will not only help you write, but we also go over a bunch of industry insider information and advice from successful writers and show runners to help you sell the idea. Choose the show that you sample wisely. The end reader will be agents, producers, and their assistants, so make sure this show is both current and making a splash in the industry. Then become a disciple of the show. Remember that, due to legal and creative reasons, most showrunners won’t read sample episodes of their own shows. But they are valuable tools to get you staffed on similar shows. Writing on his blog, John August also suggests calling production companies during staffing season (April to May) to discover what sample episodes the respective producers are reading. A pilot is an introductory episode to a series. Naturally, it takes a bit more effort to write a pilot spec than it does to write a spec script for an existing show. That’s because in a pilot, you are creating everything — characters, world, tone — from scratch. Even though you are starting with a blank page, anchor your vision with as many successful (and similar) shows as you can. For example, while writing Extant, Mickey Fisher said that he took notes while watching several episodes of shows like Breaking Bad and Friday Night Lights. His notes were about episode structure and length. Fisher said that, in addition to writing his pilot, he also wrote a season and series overview which gave him ammunition when getting asked questions in meetings. It’s true: the number of films that major studios produce every year is on a downward trend. So, naturally, the appetite for original spec screenplays isn’t what it once was. But that doesn’t mean spec film scripts don’t get sold. Considering the new avenues for content, including Netflix, Amazon, and even Apple, there is still an appetite for original material. An agent can help you with that. But it’s also valuable to keep your eye on the market. Boil your idea down to its most basic genre and premise, and look at similar films that have come out in the past few years. Do some research. How were they initially financed? Perhaps it wasn’t purchased as a spec. Sometimes, ultra-low-budget horror film scripts, for example, are produced for cheap and then sold to distributors later. Research distributors, too. Try to think about their angle for having released a film. Consider how your story plays to market demand. Finally, enter script contests. Pick from a host of high-value screenwriting competitions and narrow down to the ones that satisfy the genre and tone of your script. Also, there are legitimate success stories stemming from the Black List. This is a screenplay upload service that offers feedback and a voting functionality. You have to pay to get reads in the Black List, but this can result in your script getting seen by the right person at the right time. Don’t be intimidated by the prospect of needing so much material all ready to go. What will get you noticed in the first place is the way you express your own unique perspective and worldview. Mickey Fisher wrote at length about his journey from being an aspiring writer-actor to having his show, Extant, get executive-produced by Steven Spielberg on CBS. Chief among the many nuggets of wisdom he provides in his post is his advice to make your writing portfolio as tethered to your voice as possible. He says that, at first, he tried to diversify his potential projects as much as possible. But the lukewarm response he got guided him to align his portfolio closer with what got him noticed in the first place. So get familiar with that aspect of yourself. Make a moodboard to capture images that inspire you. Ask yourself why each image you add is particularly striking. Dig deep into that creative part of yourself. The best way to learn how to write a spec script is from existing scripts. The more you read, the more you’ll learn how to write a spec script like the pros. Find a good TV spec script example in a database of produced and unproduced scripts. Study as many episodes and pilots of similar, relevant shows as you can. For a film script, consider checking out past winners of the annual Black List. Think particularly about how each script stood out in the marketplace. Now you understand how the spec script fits into the world of the modern entertainment industry. Check out our article on writing a sitcom script, where we take you through the structure of Seinfeld and show you how the writers worked on one of the most successful shows ever.